I am trying to find a way to open up SharePoint Document Library documents in a new tab. This seems like it should be a setting option in SharePoint; however, if it is, I'm unable to find it. Is there a setting I'm over looking? Does it involve custom code? I have tried some custom code I found on the web as well as here on stackexchange, but I haven't been able to get them to work. If any one could shed some light on how exactly to implement code for this, it would be appreciated. Go to your document library page > edit page. Again, Go to your document library > from the above ribbon > library setting > Advanced setting . check open in browser . Is this needed for all libraries in your environment or just a select few? 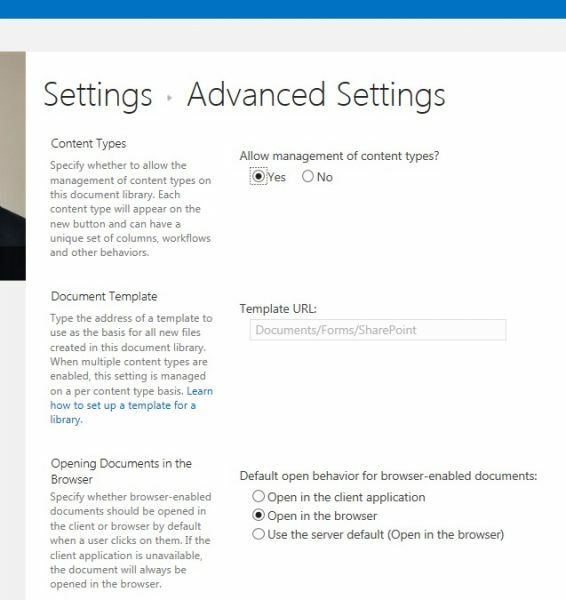 If you just need to do this for a few special documents here are the other areas of SharePoint where I know you can specify that the link open in a new window. site Navigation links have the 'open in window' check box so that is one option if you want to manually add links to each document in a top or left navigation. you can add a link to do this on a content page such as a wiki page or content editor web part. type the text then insert a link, you will then have the option in the ribbon under the link settings to open it in a new window. Can word documents in a Documents library be searched?